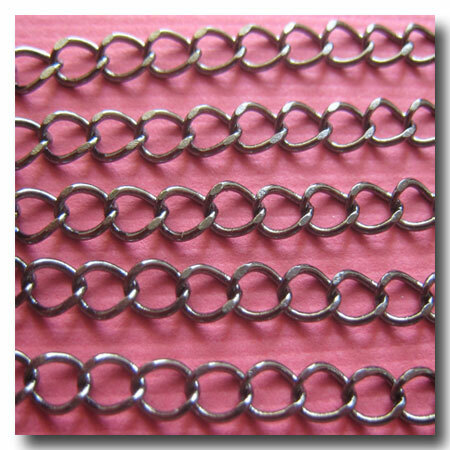 GUNMETAL PETITE CURB CHAIN. FINISH: Gunmetal. BASE: Brass base. STYLE: Petite curb design. WEIGHT: Light. DIMENSIONS: 2mm x 3mm. All CHAIN is sold by the FOOT. In the QUANTITY BOX, please enter the NUMBER of feet. Also AVAILABLE in: Gold Plate 1-122, Silver Plate 1-301, Brushed Silver Plate 1-265, Antique Brass 1-297, Antique Copper 1-093 and Bright Copper 1-097. Copyright ©2019 ChainGallery. All Rights Reserved. ChainGallery® is a registered trademark of ChainGallery L.L.C.